We were delighted to have attended the International Healthcare Engineering & Estate Management Conference again this year, having hosted a stand as well as attending in previous years, to listen to the array of expert talks. Taking place in Manchester Central Convention Centre, the conference covers a wide variety of topics relevant to clinicians, estate management, contractors, suppliers and design consultants such as ourselves. It is always interesting to be able to learn more about the unique aspects of healthcare projects, from other design consultants and also the NHS Trusts and clients who operate and manage the facilities we design. Topics discussed included an address from NHS England’s Simon Corben on the savings and increased productivity achieved as part of the NHSE works since 2016, debates on the impact of current procurement processes on healthcare facilities and the advantages of facilities delivered under P22 procurement routes. There were interesting discussions on standardisation and pre-designed facilities by Willmott Dixon taking inspiration from their education model and aiming to maximise off-site construction techniques. It was also inspiring to hear from specialists looking at predictive model simulations of patient usage to maximise planning of proposed facilities or adaptations of existing plans. We were also proud this year to present as part of the forum on what continues to be a hot topic for NHS Trusts and design teams on delivering world leading healthcare utilising Building Information Modelling. 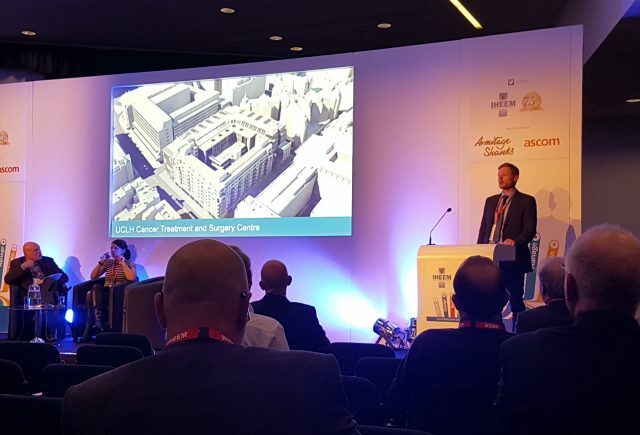 Our Building Information Manager Chad Bedard, along with Scott Tallon Walker architects and Bouygues UK presented our viewpoint from the experience gained working together on the new Proton Therapy, Blood Disorders and Surgery Facility for University College London Hospitals NHS Foundation Trust.